She vibrates on trails high above Tunnel Falls, where lakes colder than winter wait. No one sees her, only a wake follows. Her apparition is enough to remind her of words left behind—words which cut into her skin—permanent wounds. Not the simple healing of scrapes and abrasions. Once a word drills itself into your life, you bleed forever. She searches here, among wooded trails that crisscross, meet, and intersect. Quiet is somewhere. Quiet is nowhere. Death is a question for her, an inquiry that begs for no answer. Stillness responds to no one. An explanation would calm chaos, quelling the tallest crashing waves. It’s an impossibility isn’t it, what she looks for? The death of words only occurs in total silence, where no heart beats, where no nervous system hums, beyond the vibration of ghosts, beyond the ability to haunt, as words have a habit of haunting. Forest trails never end, no matter how many times she wanders off the path, wandering away from the past, where snow pretends to sing a soothing song and branches of the biggest Douglas Firs fill dead nostrils with desire. The past never ends its stretching out into the future, before her, built of stories, false, with a showering of truth, sprinkled by well-planned words. This is the story she roams within. Stories have an ending, but not to ones who write them and certainly not to characters who live within. All they will ever say and have ever said are living as worms within her blood. She can’t take a knife to herself and end it all, for she is already not alive, reborn into death. Words bounce along the roots and rocks, threatening to continue beyond. She refuses to come back inside. She transmits no warmth and toes are chilly to the touch, and her mouth, an ice-cold kiss. The out-of-doors is embraced, an undependable theory she must fashion—interpret—words, bend them to her will, as others shape them into weapons. She searches for quietness, outside paragraphs, chapters that cut deep into her outer shell. She writes, when the rain turns to snow and her body is carved upon in longhand. It is not the coldness of the body stilling the reading, the fleshy soft housing trapping the soul, but a home where quiet lies and roving ceases. Quite intriguing, and beautifully written. This is like poetry. Lovely. I very much enjoyed this piece. I attempted to fuse poetry with prose. It’s quite beautiful. I love the way it feels on my tongue. Yes, I guess it should be read out loud. It is a poem, yet not. I think you succeeded. Like the below comment, it rolls along elegantly. One of my favorite pieces of yours that I’ve read I think. Very wonderful. I love the mystery and beauty of your words. 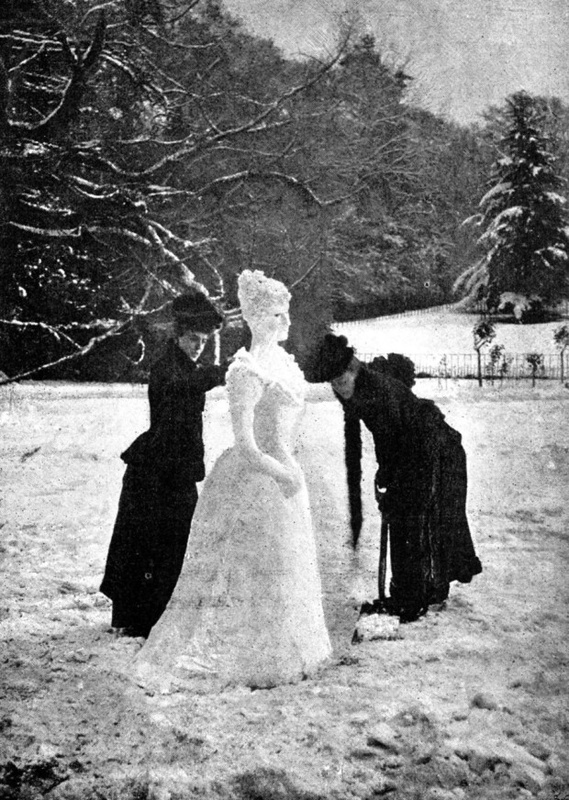 The Victorian snow lady is lovely. That’s an incredibly awesome picture! And beautiful writing. This piece is enticing and makes me lost in thought. Love the imagery. I love the beautiful paths that this writing carved in my mind. Simply gorgeous. Thanks for following my blog so that I could discover you as well. Lyrical magic, especially the last two lines. Yeah, I had to use my wand on that one. Now my arm is sore. Thanks for the kindest of compliments! Reminds me too of the paradoxes of the Snow Queen. one of the most amazing articles I’ve ever read!